Zachary was interested in working in the web design field. When he graduated from high school, he went to his vocational rehabilitation (VR) agency for support to find a job. VR arranged an evaluation of Zachary's skills by a web design studio. The evaluators suggested that he go back to school for more training before he looked for a job. However, Zachary was always more comfortable working on his own with computers, so he decided to train himself rather than take classes. A year later, Zachary began looking for computer jobs at local stores but had difficulty, especially without a college degree. He asked his VR agency to arrange another evaluation of his skills. They referred him to Margo, a job developer, who arranged for Al, the owner of a web design studio and a personal acquaintance, to evaluate Zach's skills. Margo had attended a local business exhibition two weeks earlier, where she had met Al. Margo sees networking as natural for a job developer, and is always thinking about the job-seekers she works with when she is out and about in the community. "We all try to network as much as we possibly can," Margo says. "But networking is not just introducing yourself to someone. Networking is actually getting to know the person, getting to know something about the business, and letting them know something about you and your passion for the job that you do." When Margo met Al, she asked if he would be interested in evaluating job seekers who wanted to work with computers, with no pressure on him to hire them. He agreed to help. When she learned about Zachary's interest in computers and skills on the web, she knew Al would be the right person to see how much Zachary had learned and how employable he was. Al learned about Zachary's history and that he had designed his own website. He decided to consider Zachary's website his resume, and asked Margo to have Zachary send him some of his most recent work. Al was impressed with what he saw, and set up a meeting with Margo and Zachary. He asked Zachary many questions about himself and his skills, and enjoyed talking to him about his talents and challenges. At the end of the meeting, Al surprised both Zachary and Margo. He told them that he wanted to hire Zachary as a part-time HTML programmer, and that he and Zachary would learn from each other about how best to work together. Zachary does professional web design and earns minimum wage, working part-time for Alkon Consulting in St. John, Indiana, about 12 miles from his home. He works once a week in the office for four hours, with support from one of two job coaches who have helped him since he started his job. He also works for about ten hours a week from home. 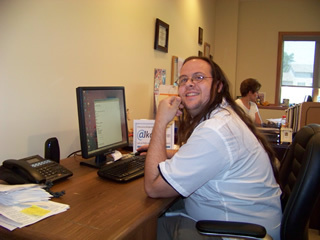 Zachary creates websites, posts text and graphics, and builds databases for the studio's wide variety of customers. He has worked at the studio now for two years and is doing well. He is extremely happy with his job because of all the programming he gets to do. He recently worked on a website whose content included lots of long chemical formulas, which he enjoyed writing. Zachary has learned new skills he uses at work and in his life. With help from his job coaches, he has learned to interact more comfortably with his colleagues. He has learned to slow down and think logically about problems, whether he wants to find a way to program something on a website or sort out a problem in another area of life. And as Al predicted, he and Zachary did learn from one another, especially about web design. Al's formal training in this field allows him to teach Zachary new web design skills, while Zachary's self-taught knowledge helps Al find new ways to deal with web design challenges. Zachary has become confident about using public transportation to and from work, and chose a transportation provider on his own when he found one that could serve him better. He has gained enough confidence in his abilities to approach his VR agency about finding more work in addition to everything he's doing for Alkon Consulting. Margo, the job developer, networked in an active way. She learned about what Al did, told him about her work, and asked if he would help evaluate people who wanted to work in his field, with no pressure to hire them. When people network to get to know one another, they can find that each of them has a need the other can meet. Margo needed someone who could evaluate job-seekers interested in the web design field, and Al needed a programmer with Zachary's skills.